Review: I finished this book several weeks ago and still can't stop thinking about the ending. I both loved and hated it. At it's core, I Am the Messenger is about paying it forward. 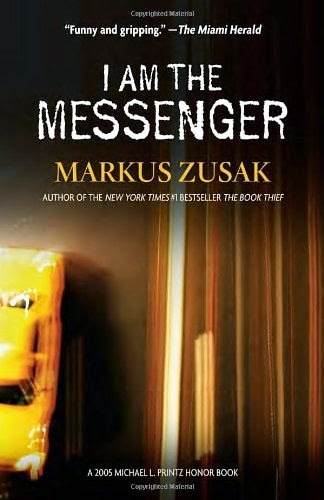 The message of this book is wonderful and Zusak is a master at writing realistic characters. The first chapter was excellent but it still took awhile to warm up to Ed, his dog and group of friends. Throughout the book Ed is sent cards and goes on missions (per say) that help people in various ways. Simply speaking-he's essentially a stalker who does (mostly) good deeds. Zusak is such a good writer however, I was routing for Ed and wondering who was behind the cards. That is where the controversial ending comes in. It's very 'meta'-I can't say how I wanted it to end or how it could have been different, but it's just left me feeling very unsettled. Overall-this is a wonderfully written book with a positive message and realistic characters. It was slow in the beginning and a little head scratching at the end, but I enjoyed it.